eSATAII (aka external Serial ATA) support is one of the most exciting features to pop on motherboards recently. When it comes to external mass storage, bandwidth has always been an issue, and Serial ATA makes even IEEE 1394b's 800Mbps bandwidth look paltry by comparison. The P5B Deluxe/WiFi-AP has one external SATA (eSATA), and one Firewire port at the rear I/O. This connection uses a slightly modified SATA cable (not included), which is better suited to external connections. 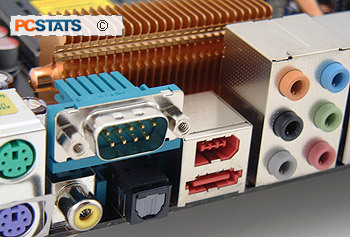 Standard internal Serial ATA cables are sufficient for internal connections, but SATA-IO governing body decided a while back that the external version should be a somewhat different format, thus creating the eSATA standard. eSATA enclosures for SATA hard drives are widely available, and the great thing is that hard drives connected over this standard are just as fast as internal devices. The connectors are hot swappable, so it makes adding and removing an massive external hard drive about as complex as plugging in a USB memory key. For anyone who as ever had to move Gig's of data over a USB cable, eSATA is simply awesome. The Asus P5B Deluxe/WiFi-AP motherboard is a high end motherboard and thus comes with everything but the kitchen sink. In the box we find a stereo SoundMAX Superbeam microphone. It comes with some Velcro patches which allow the microphone to attach your monitor. If that's not your style, the microphone cable is 183 cm (6 feet) long, so it can be put just about anywhere. The Q-Connectors are little jumpers that make connecting front panel I/O, USB or IEEE 1394 headers a snap. Since the standards are different per manufacturer, cases often come with front panel connectors broken down to one pin per line. If you're a tweaker, this makes removing the motherboard from a case a tedious task. With the Asus Q Connector, you can connect all the case front panel pins to the proper Q connector then connect that to the motherboard when you're ready. Removing the motherboard to do some maintenance? Simply remove the Q Connector from the board and plug it back in when you're set. Asus even labels the individual pin values from ground to power and data. The Asus P5B Deluxe/WiFi-AP motherboard uses a standard omni directional dipole antenna which can be placed up to 40 cm away from the computer, that should give you enough slack to put the antenna in a good position. As we mentioned, the antenna has a magnetic base so it will stick to steel surfaces. 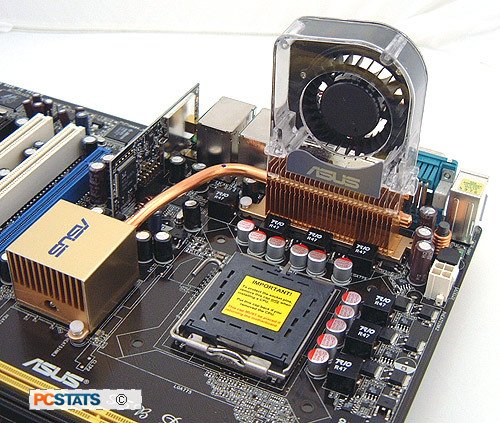 The Asus P5B Deluxe/WiFi-AP motherboard has a large passive copper heatsink on the processor VRM, connected by heatpipe to the fanless northbridge heatsink. The Intel P965 Express chipset generates a good deal of heat, but in this situation it is a heatpipe that conducts the heat over to a 28 fin copper heatsink which is cooled by exhaust airflow from the CPU heatsink fan. The ICH8R Southbridge gets away with a low profile passive aluminum heatsink. The finned copper heatsinks the power MOSFETs requires active cooling if a passive CPU thermal solution is used. The quiet squirrel cage fan bundled in with the Asus P5B Deluxe/WiFi-AP motherboard is used in these instances. 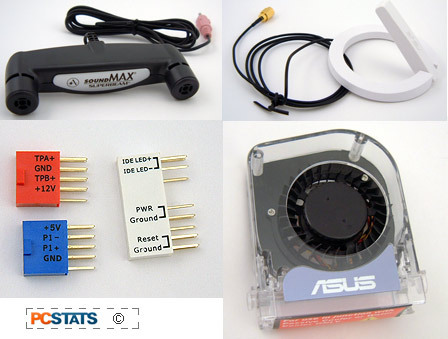 The fan attaches to the heatsink directly, and draws power from a nearby 3-pin header, so it doesn't interfere with the 4-pin PWN fan header for the CPU heatsink fan. The Intel P965 Express chipset gets hot, but the Asus cooling system does a good job at dealing with the heat quietly. Next up PCSTATS will be running through the basic features and capabilities of the Intel P965 Express chipset, and how it stacks up before diving into overclocking and plenty of office oriented and gaming benchmarks... but first a look around the Asus P5B Deluxe/WiFi-AP motherboard!